In the Framework of the PAUWES-YESS INITIATIVE, a webinar Series is being organized on Sustainable Development In Africa: Shaping the future of the Continent. the Pan-African University, Institute of Water and Energy Sciences (PAUWES) and The Youth Earth System Scientists, YESS-Community (YESS Africa team), with the contribution of future Earth’s Food-Water-Energy Nexus knowledge-Action-Network (Nexus KAN) and the United Nations University (UNU), are pleased to announce the first edition of the webinar series on the sustainable development in Africa: The role of science and social engagement in shaping the future of the continent. 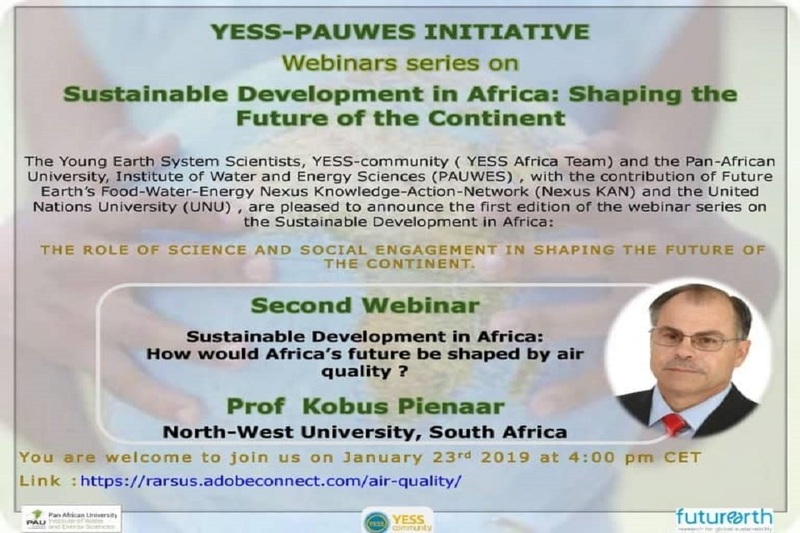 For its second webinar which was held on the 23rd January 2019 at 4:00 pm CET at PAUWES, the theme was: Sustainable development in Africa: how would Africa’s future be shaped by air quality?, with Prof Kobus Pienaar, from North-West University in South Africa. 0 responses on "Sustainable development in Africa Webinar"